Prototype: DP-14 HAWK | Dragonfly Pictures, Inc.
Fast and agile: Speed up to 105 kts. The prototype DP-14 Hawk is designed to carry 430 lbs useful payload. Its large 23-cubic-foot internal cargo area is over 6 ft. long and over 20 inches wide. This system is not ready for production/purchase yet. 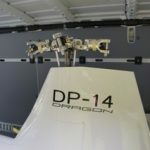 The DPI DP-14 Hawk is a prototype multi-mission autonomous UAV designed for precision aerial resupply. With an advanced tandem design, the Hawk has remarkable performance within its small footprint. It can carry up to 430 lbs. useful weight over long distances operate in crosswinds up to 40 kts., and fly at speeds up to 105 kts. 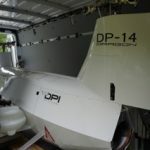 The DP-14 Hawk is designed to fit in a standard utility trailer or Sprinter* van. 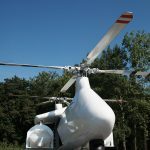 The rotors can be removed and/or installed in about 5 minutes for transport. 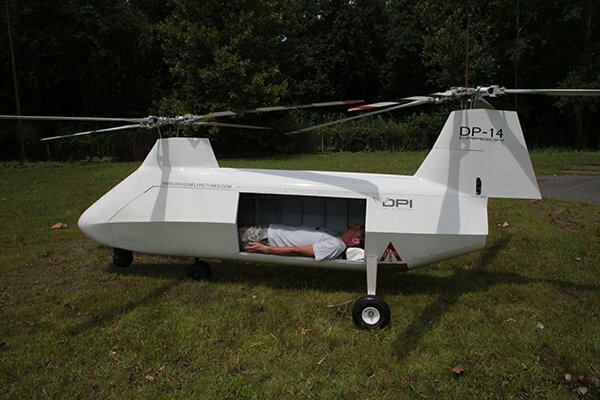 The prototype DP-14 Hawk’s internal cargo area is 23 cubic ft., over 6 ft. long, and over 20 inches wide. 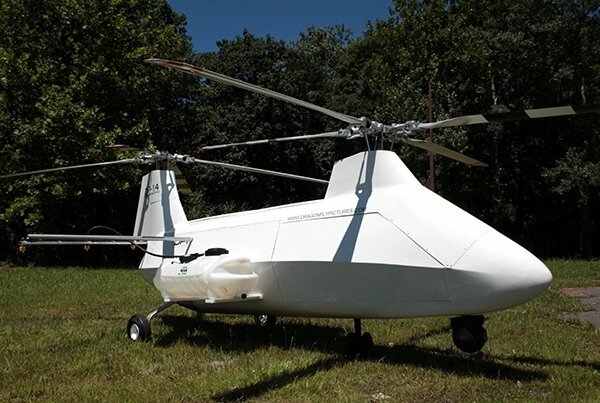 The prototype DP-14 Hawk is a modular tandem helicopter, with a wide center of gravity envelope. 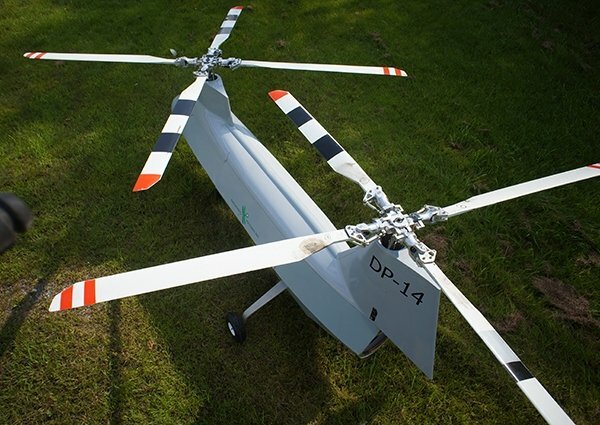 With the prototype DP-14 Hawk, you can configure the Hawk to optimize your payloads for your specific applications. Payload - The DP-14 Hawk is designed to carry 430 lbs useful payload for 2.4 hours. 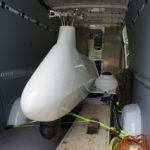 Operators can increase range by trading payload for fuel. DP-14 Hawk configured with camelback and external loads with release mechanisms for precision drops. A tandem UAV, the prototype DP-14 Hawk has a stable hover and can operate in gusting winds to 40 kts. The Hawk also has 1 ms autopilot cycling and rapid pitch correction during autonomous cargo offloading. These capabilities allow for precision cargo drops with accuracy better than 3 meters, in real-world flight conditions. Small Landing Site Size. The DP-14 Hawk has a smaller footprint than today’s comparable resupply UAVs, so its landing site can also be smaller. 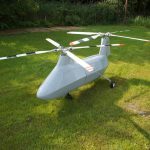 This enables more options for landing and offloading in challenging terrain. Autonomous Take-Off / Landing. The DP-14 Hawk uses IMU and GPS, not visual cues, for takeoff and landing, and an ultrasonic sensor as a rangefinder to determine the height from the ground during landing. These sensors allow for landing even in brownouts and degraded visual environments (DVE). Intelligent Landing Site Selection. 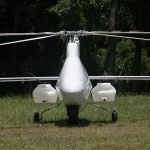 The DP-14 Hawk uses scanning LIDAR and its onboard vehicle management computer (VMC) to analyze terrain for roughness, slope, grade, trees, and other objects; length/width of open area; and proximity to the target landing site. The Hawk’s stand-off distance for autonomous landing site selection is high enough to prevent brownouts during site analysis. Landing Gear. 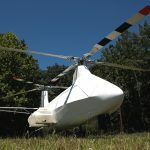 There are several options for landing gear, including all-terrain landing gear. 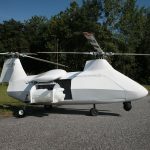 All-terrain landing gear allows the DP-14 Hawk to land at unprepared sites, on uneven ground, slopes up to 15 degrees, and the decks of heaving, rolling, pitching ships.Ŧ DPI can also customize the landing gear to your specific application or mission. Rotors can be installed or removed in about 5 minutes. 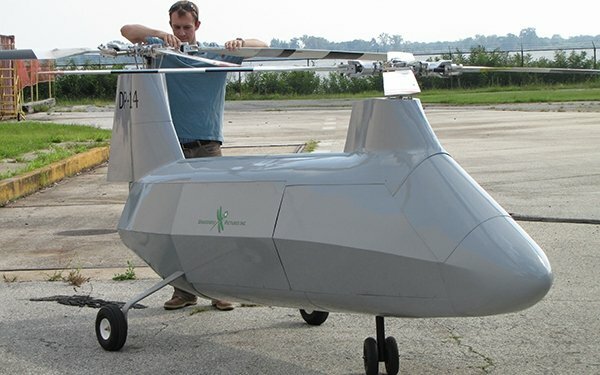 DP-14 Field Hawk, configured for precision agriculture spraying, such as for invasive species. 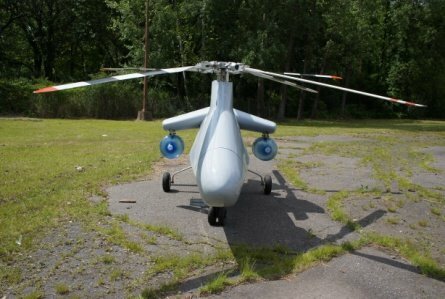 DP-14 Field Hawk, configured for precision agriculture, aft view showing spray rig and fluid tanks. 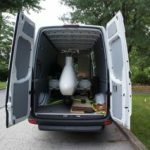 The DP-14 Hawk is designed to fit inside a standard Sprinter* van. The DP-14 Hawk, inside a standard Sprinter* van. 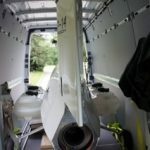 The DP-14 Hawk fits inside standard Sprinter* van, even with external loads (fluid tanks for agricultural spraying). The DP-14 Hawk fits inside a standard Sprinter* van. 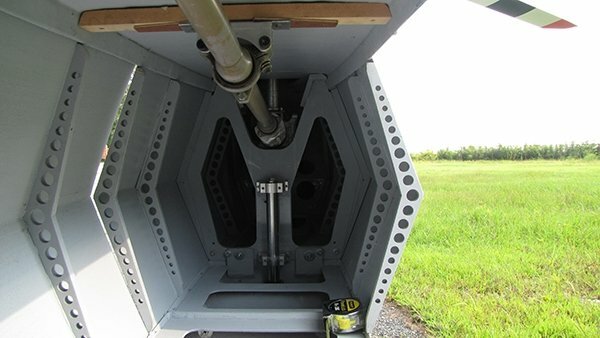 It takes about 5 minutes to remove (or install) rotors in order to transport the DP-14 Hawk. Designed to fit into a standard Sprinter* van, the Hawk has plenty of clearance between rotor heads and the ceiling of the van. DP-14 Hawk with external loads as well as internal cargo. The DP-14 Hawk with internal cargo area open, camelback, and fluid tank payloads. 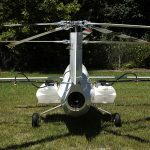 The DP-14 Hawk configured for precision agriculture, with spray rig and fluid tanks.